In today’s hyper-competitive environment, insurers are operating under shrinking premiums, growing customer expectations and tightening regulations - all of which are narrowing their margins. Falling investment returns, tougher competition, rising operational costs, managing risks, supporting multiple distribution channels, complying with regulatory changes and shifting customer preferences are sticky areas any insurance company has to tread on, at any time. Today the insurance industry is being radically reshaped by the record-setting pace of new entrants, consolidation, and product commoditization. In this changing landscape, insurers have to invent ways to offer more value than ever before. As is obvious, no insurance company would want to battle inefficient operations that stem from disparate systems or obsolete technologies underlying these systems or be saddled with aging legacy systems that simply can’t accommodate the growing needs. With Quintegra’s partner-based non-life insurance management framework, you can streamline business operations and bring in flexibility to accommodate changing business demands. The Insurance Practice at Quintegra provides smart and innovative solutions to several leading insurance companies around the world. Partnering with a leading provider of insurance management system, the Insurance Practice provides a revolutionary IT framework for effective and efficient management of non-life insurance business. The system is a fully integrated software solution specifically designed to manage the book of business of insurance carriers and MGAs. 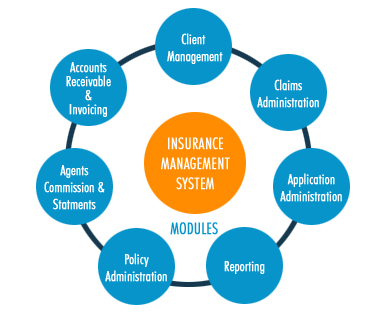 This end-to-end insurance administration system rates & issues policies, invoices premiums, tracks receivables, records claims and manages agents and commissions. It is configurable for multiple product offerings, states and issue companies. Intuitive web interfaces allow agents to easily submit business to your company and to inquire issue status online. The framework includes several interactive subsystems that are easy to deploy and configure. From managing policy information to establishing unique business rules, the entire suite of applications is designed to be user-friendly, intuitive and highly customizable. Policy Administration – supporting multiple issue companies, multiple product lines, multiple states, multiple year policies, including blended risks and coverages; several rating options, interfaces to external reporting systems and full premium details. Accounts Receivable & Invoicing – supporting full suite of financial transactions and versatile invoicing capabilities. Agents Commission & Statements - supporting associate Agents at the Policy level or at the coverage level within a policy, setup of commission due based on written premium, on invoicing or on premium payments and generating agent statements. Client Management – supporting single repository for client demographics and client relationships. Claims Administration – supporting cases and claim records & Loss Reserves, Financial Transactions and Claims Expense records. Application Administration – featuring robust user interface, versatile policy product configuration function, versatile rates and factors configuration function, tax configuration and forms configuration. Reporting - supporting interface to external reporting tools, configured to work with Crystal Reports and automatically generation of policy forms based on policy products, coverages and policy transactions. The solution offering has a unique context based navigation feature, in addition to menu based navigation. Context based navigation minimizes errors and makes access to information very efficient. Information access has been logically organized around the context of access. It also has a unique design where functions are kept close to the context, which minimizes new user training needs and the need for a lot of data entry to retrieve information. Users will have the ability to attach unstructured information to transactions or to a context in the form of notes, lists, and/or attached electronic multimedia files. It gives users the ability to organize electronic files based on a business context rather than disk drives and directories. It includes a full suite of functions for system administrator to setup user security, diagnose system, maintain the database and schedule application jobs. A configurable System tool bar has unique features to aid user efficiency. Several data displays can be exported to other windows applications. The framework is built using a true three-tier architecture model. This makes it easy to progressively migrate to different interface models (like web browsers) without having to rewrite business logic or replace the database. The first tier contains the application interface (client), runs on a Windows operating system (Windows 98, Windows 2000, Windows XP, Windows NT). The second tier contains the business rules (server), runs on a Windows 2000 Advanced Server operating system. Bridge layers in the second tier establish scope and sequence of transaction objects. This allows easy customization of transaction flow without modifying or "tinkering" with functional components and preserves overall system stability. The third tier contains the data repository and database procedures (database), which can be implemented either on MS SQL Server (7.0+) or Oracle (8.1 +) database. The application has a flexible design to easily accommodate custom software changes without affecting base application software components (Facade Bridge). This allows clients to receive upgrades without loosing custom additions or receiving unwanted functions developed for other clients). The solution is being used by numerous insurance organizations across the globe to support their mission critical business operations. We understand that your requirements include efficient sales & service cycle, improved cross-selling & up-selling, faster time to market, accurate premium, commission & claims estimation, financial control, anytime, anywhere access, real-time processing and better security & integrity. With our solution, trying to achieve all these is not difficult anymore.